In Greek mythology Iolaus was the nephew of the Greek hero Heracles, with Iolaus being the charioteer of the hero, as well as a trusted companion. Iolaus was born in Thebes, the first born son of Iphicles, the half-brother of Iphicles, and Automedusa, a grand-daughter of Pelops. Iolaus would have at least two half-brothers when Iphicles later married the youngest daughter of Creon, but these brothers were said to have been killed by Heracles when madness overcame the Greek hero. ​Despite the death of his siblings, Iolaus would often be found in the company of Heracles, acting as a charioteer and weapons bearer for the hero in many of his adventures. Most prominently though, Iolaus is present when Heracles undertakes his second Labour set by King Eurystheus, the slaying of the Lernaean Hydra. ​Initially Heracles attempted to kill the Hydra by himself, but every time Heracles cut off a head, two new ones grew from the open wound. A plan was thus concocted, and enacted, where by Iolaus would cauterise the neck wound, preventing new heads from growing. 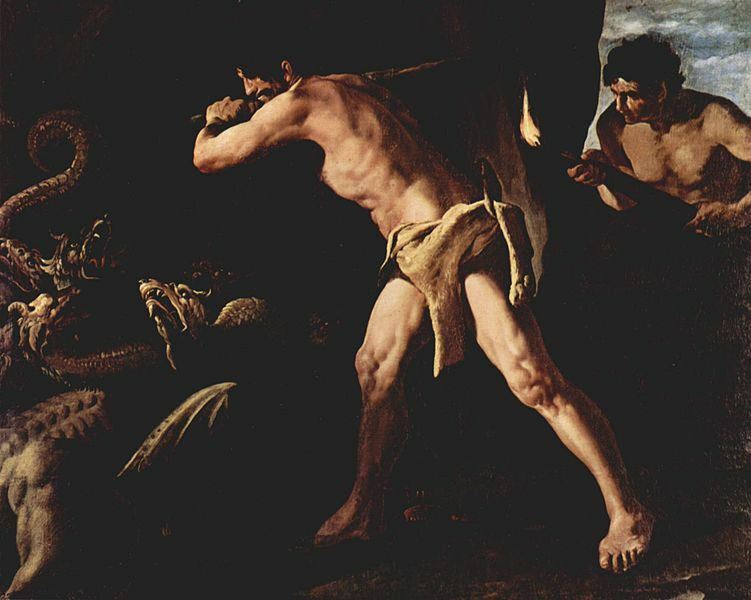 The assistance of Iolaus in slaying the Lernaean Hydra would eventually see Eurystheus ignore the successful completion of the Labour, causing an additional labour to be set. Hyginus, in Fabulae, names Iolaus as an Argonaut, although other writers ignore his possible presence, and indeed when Heracles is left behind during his search for Hylas, there is no mention of Iolaus staying alongside Heracles and Polyphemus. The skill of Iolaus as a charioteer was best displayed not in the adventures of Heracles but in the games that took place around Ancient Greece. It was said that, after Heracles had inaugurated the Olympic Games, Iolaus took first place in the four horse chariot race. Likewise, Iolaus was also said by some to have been victorious during the funeral games for Pelias. As a trusted companion of Heracles, Iolaus was also said to have been given Megara to be his bride, following the completion of the 12 Labours. Megara was the first wife of Heracles, the woman who bore the hero several sons, before they were killed by Heracles; some tell of how Heracles killed Megara as well, although some tell of a simple divorce, leading to her remarriage to Iolaus. Megara would give birth to one daughter for Iolaus, Leipephilene; when of age, Leipephilene would be considered one of antiquities great beauties. ​Heracles would subsequently marry Deianira, but then an Oracle told Heracles that his sons were to colonise Sardinia. The sons of Heracles for this task were 40 of the 50 sons born to the daughters of King Thespius; Heracles earlier in his life having slept with the 50 daughters on 50 consecutive nights. Command of this colonisation effort was given to Iolaus, with the Thespians joined by colonists from Athens. Through victory on the battlefield, Iolaus and the colonists conquered large areas of fertile land, and it was said the Iolaus was the founder father of the city of Oblia, whilst the colonists were called Iolarians in his honour. There is one further famous tale told about Iolaus, which occurred after the death of Heracles, although there are different embellishments upon the myth. Upon the death of Heracles, King Eurystheus sought to kill of the hero’s descendants, the Heraclides. The Heraclides would be chased from city to city, before they found sanctuary within Athens. Demophon would not give up the refugees, and so war was about to take place between the army of Eurystheus and the combined force of Athens and the Heraclides. By this time Iolaus was a relatively old man, but Iolaus would pray to Hebe, the goddess of Youth, to rejuvenate him for one day. Hebe answered his prayers, after all the goddess was now married to the Apotheosised Heracles, and so Iolaus took to the battlefield in defence of his kin. Some tell of how Hyllus killed Eurystheus, but some give that honour to Iolaus. Alternatively, Iolaus was already dead by the time Eurystheus sought to end the Heraclides at Athens, in this case Iolaus implored Hades to be allowed to return to surface world to be of aid. The wish was granted, and Iolaus killed Eurystheus, before descending once again to the Underworld. Occasionally it was said that Iolcus was buried in the tomb of his father, Amphitryon, after his death, but most tell of how Iolaus was not buried in Thebes, but was instead buried upon Sardinia alongside Megara.